What souvenirs should you buy on your trip to Korea? A while ago, I wrote a post on my top 5 favorite Korean souvenir gifts and they still hold true to today, with a few additions. Korea has a lot of cool things to buy. But sometimes it’s hard telling the difference between what’s “Korean” and what’s just “Asian”. This post offers a two-part video series about what the best “Korean” souvenirs and gifts to buy when you’re in Korea. A Guide to Cool “Korean” Things to Buy in Korea (or watch Part II) . Below are tips and information on where you can get these cool Korean things in Seoul. Some of these can be bought online too! Tip: Buying DVDs and CDs in Korea isn’t as cheap as you’d think they’d be, but they’re a bit cheaper than the U.S. If you’re buying DVDs or CDs, make sure the DVD is subtitled with your language. I usually look on the back for this information. It’s marked as Region #1 branding and you’ll see your language mentioned (aka “English subtitles”). Here’s a DVD region code table to check which you should get. I bought my dvds from the places below. There’s one seller I used to get dvds from real cheap, even though the site looked sketchy. I still took a gamble. A Guide to Cool Things to Buy in Korea (Part II): click here if you can’t see it. 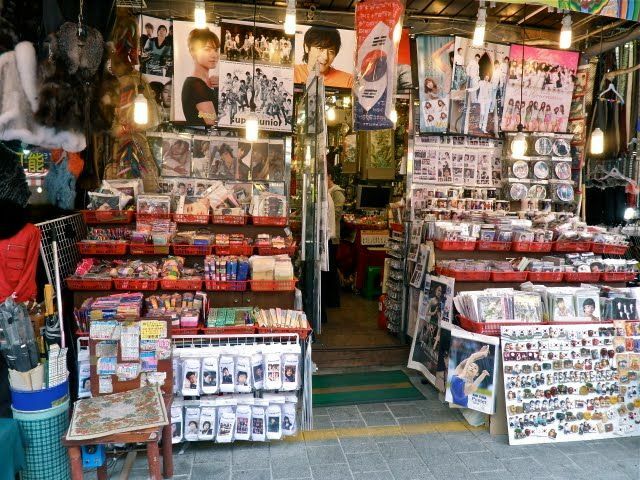 Where to buy: Koreans love cute and you’ll find many cute items all around Seoul, in areas such as Hongdae. But for cute souvenirs that spell historical “K.O.R.E.A. “, Insadong is the place. Not only did my mom get me that cute bear in a hanbok there, but I’ve also bought cutesy hand-crafted cellphone holders, wallets and keychains which bear traditional Korean theater mask styles. I also wouldn’t underestimate trinket or cellphone accessory street vendors or in the underground metro malls. I’ve seen keychains with miniature bottles of soju and the Korean won. A breakdown of Seoul neighborhoods: 9 Places to Make you Fall in Love with Seoul. Myeongdong is the area you’ll have them all the beauty product shops in one place. But beauty/skin care shops like Faceshop, Missha, Nature Republic, Tony Moly, Hollika Hollika are ubiquitious in Korea. You’ll find them at any multi-department household store and even in underground metros. I’m a huge fan of BB cream. BB cream has absolutely changed my life from a non-makeup wearing person, to someone who would love to have Song Hye Kyo’s skin in the small time it takes to put on an all-in-one product. So when I go to Korea, I stock up on them. Cost: 10,000 -24,000 won. They’re generally over 10,000w, but not by much; especially compared to U.S. prices which are literally, thrice the cost! Tip: These are occasionally free when you walk into a skin care store with a girl holding a basket outside. Check those baskets they’re passing out! However, beauty care shops also do huge deals on bulk facial packs for relatively cheap. Asia in general has a different aesthetic from the West. So you’ll find curious novelty items that you might not ordinarily see at home. How about some double-eyelid tape, a jaw massager to reduce your jawline or even a facial slimming V-Line mask (watch my video here)? Where to buy: Check out Yongsan Electronics Mall (located outside Yongsan station), Techno Mall, E-mart and Lotte. Tip: If you’re going to Yongsan Electronics mall, be prepared to know your prices and negotiate. Not all technology is cheap in Korea. In fact, often I’ve found it to be otherwise. For haggle stress-less shopping, I’d go to Emart and Lotte. The hanbok is the traditional costume of historical Korea. It is what the kimono is for Japan and the sari is for India. As such today it is still worn by Korean women and men during very special occasions and celebrations. Cost: Hanboks (top and bottom) run from 130,000 -700,000 Won, depending on the fabric quality. Hanboks are sold custom made and can take anywhere from one to three weeks. Where to buy: Any grocery or convenience store. If you forget about it, you can buy them at the airport. Tip: I’ve gotten them at the airport, because I didn’t want to risk them cracking in my luggage. If you pack them in your luggage, use your clothes to pad and bundle them. Another alternate is to take a padded wine holder. It’s a great way to transport wine bottles when you’re traveling or just going to a party! Where can I get these things if I don’t go to Korea? Many people can’t afford a trip to Korea but still want to feel a part of culture. I’d suggest hitting your local K-town (aka Korea town) and checking out some of the Korean stores and grocery stores. Korean festivals might also sell some Korean products. Also, beauty product stores are rapidly popping up~ Faceshop, Nature Republic, Missha. You’ll definitely pay export costs on these things, so it’s best gotten in Korea if you can..
Watch Travel Tips on Seoul & Korean Culture! What have you bought when you were in Korea? What type of “Korean” gifts souvenirs would you recommend? Actually you can get metal chopsticks in Malaysia as well as well as metal Chinese soup spoon with long handles so it wouldn’t slide into the big bowl when you are eating noodle soup. I always bring back a couple of boxes of the Jejudo chocolates, especially the orange and cactus flavored ones. I have a opposite situation I need help with.. What should I buy to give to my host in Korea from the US? I will be staying in a Hanok in the first part of my tour next week and want to get something from here as a gift for them. Any suggestions? I am from Seattle so I already thinking of smoke salmon from Costco but anything else you might suggest? I live in Korea….I’m a Korean…. Great list of ideas. I’ve even found soju in tetra packs and small plastic bottles (flask shaped). No need to worry about glass breaking. Thanks @Barbara. Good to know! Thank you of these suggestions! Learning what a Hanbok is was interesting. @Christopher: Glad you enjoyed it! My personal favorite: Korean style $2 chuck (aka Jinro wine). Basically soju fortified grape juice … drank way too much of it during my time in Korea! @Caroline: Grape juice, huh? Glad you enjoyed it. Yongsan Electronics Mall is probably going to be my first shopping destination the next time I’m in Seoul, South Korea. Korean electronics is simply amazing. They’re so progressively creative and they last a lifetime. One really gets his money’s worth on such items. Just when I was planning my Trip to Korea, I see your post! Follow me please. Korea is so much like China when it comes to shopping. Chinese are so obsessed with beauty products and clothes. They spend a lot of money on online shopping. Is soju a strong alcoholic drink? @agnesstramp: Maybe it’s an Asian thing, haha (joking).. Koreans LOVE to shop online too actually. And yes, soju is strong. Not sure why people like the taste. Hi, I just wanted to let you know that Region 1 DVDs are for US DVD players. Region 2 is Europe, Japan, and a few others. Thanks for the correction @ladyshura! It’s changed For the longest time I thought it was Region 2 and I have some region 2 dvds in my player. Maybe I have a universal player.